To find an NS issued German passport at their consulate in Ljubljana, Slovenia is something outstanding and rare! The war in Yugoslavia began on April 6th 1941 with bombing Belgrade. Yugoslavia was quickly defeated, surrendering in Belgrade on April 17 1941. The government fled into exile. Slovenia was occupied by Germans, Italians and Hungarians. The German Reich claimed the northern and eastern areas (Carniola, Styiria and Posavje (neighboring areas with Croatia along rivers Sava and Sotla), Hungarians took Prekmurje, Italy the Central and Western part of Slovenia. 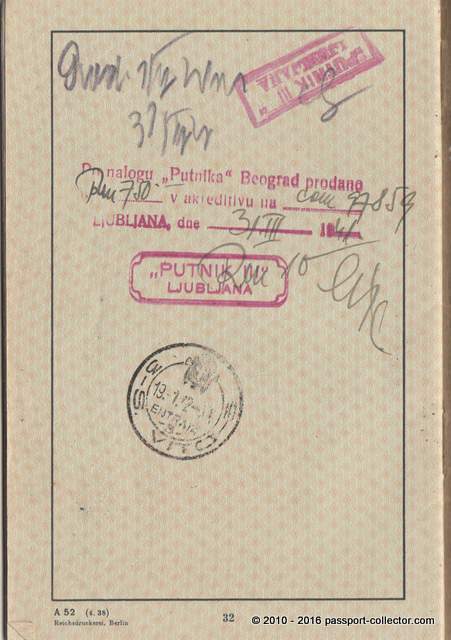 All three occupiers wanted to include Slovenian territory into their states. Italians and Hungarians did that officially. Germans due to various reasons did not (troubles with deportations of Slovenian populations and with germanisation, resistance movement), but they used German racial legislation on occupational territories. All the three occupational forces condemned Slovenians to ethnocide. However, their methods and the required time in which the plan was to be carried out differed. 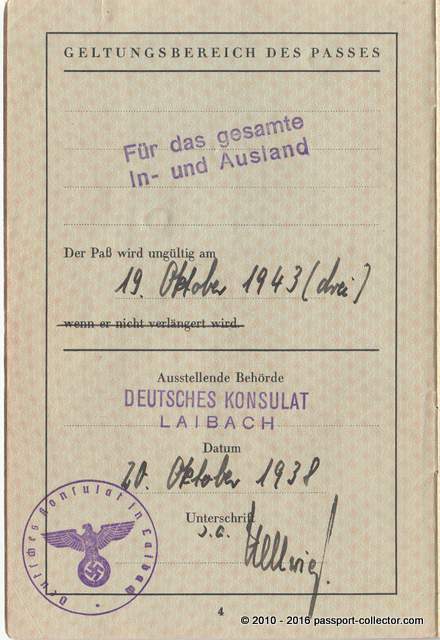 Most drastic deportations were carried out by the German occupants. The German leadership assigned the responsibility for the solution of the “Slovenian question” to various offices under the leadership of Heinrich Himmler, the state secretary for reinforcement of germanness. Jews from Maribor were deported to concentration camps. Maribor was also the site for a German POW camp from 1941-1945 form many British, Australian and New Zealander troops. 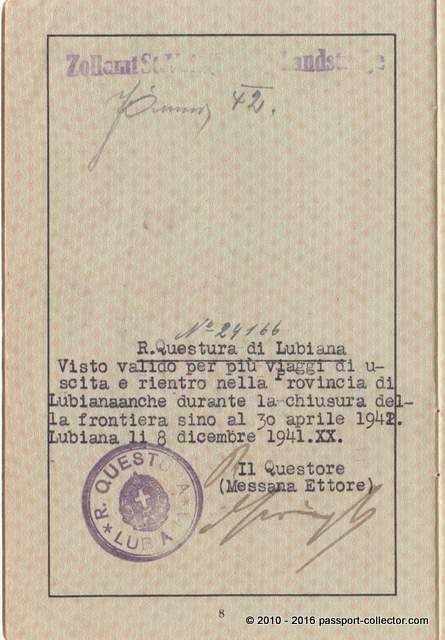 In the Italian occupational territory similar plans as in German were made in spring 1942: there were planned mass deportations of the Slovenians and Italian colonization of the emptied Slovene territories. However, Italy surrendered before the above plans could be implemented. Yet, the Italians succeeded to deport about 25 000 thousands Slovenes into Italian concentration camps. The Hungarian occupiers deported those Slovenes who moved to Prekmurje (the river Mura region), which was allotted to Yugoslavia after World War I, until World War II. About 600 of them (mostly immigrants from Primorska, the territory awarded to Italy after World War I) were deported to the concentration camp Szaszvar in the spring of 1942. After the German occupation of Hungary and Prekmurje, most of the Prekmurje Jews (452 persons) were imprisoned in concentration camps. 328 of them were then killed in Auschwitz-Birkenau in April 1944. 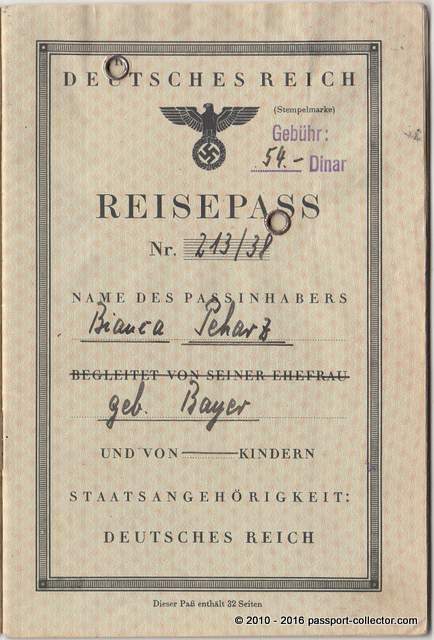 German NS passport issued at the consulate in Ljubljana/Laibach (Slovenia) in 1938 and valid till 1943. 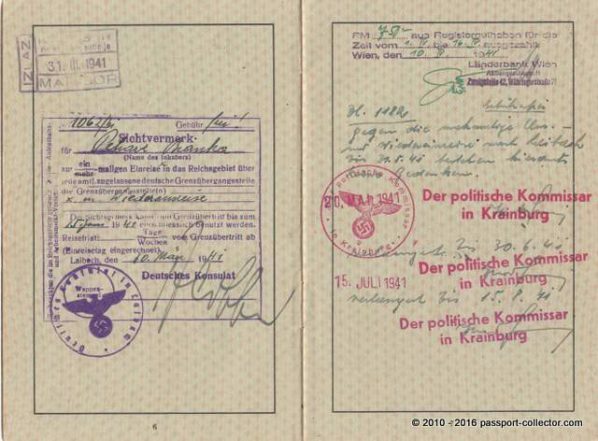 German visa 1941, 3x red NS stamp political commissar 1941, stamp Maribor 1941, stamp questatura Lubiana (Italians) 1941 – permission for Ljubljana till 30th April 1942.I have seen thousands of passports in well over a decade of research and collecting but this is the very first one issued at this consulate. 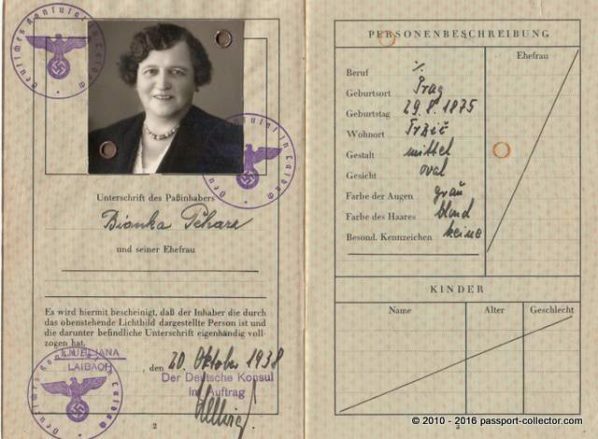 Next Next post: Ever heard of a Fiume Passport? No? Here is one. I guess not according the article. Cheers, Tom.